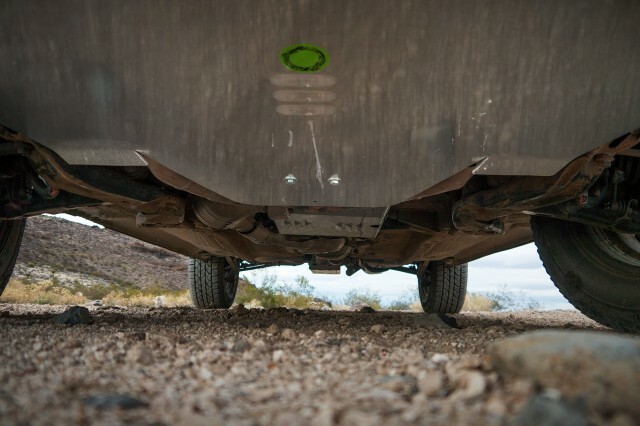 With the necessary capability upgrades sorted, our focus shifted to protecting the soft underbelly of the Forester. Subaru did a fine job keeping most of the vehicle’s components tucked even with the frame rails, but not so well offering skid plates for the vulnerable oil pan, transmission and rear differential. Fortunately, the simplistic design of the chassis makes aftermarket protection both affordable and easy to install. I have a confession to make: when I accepted this assignment I had serious doubts. Before this project I had never thought of a Subaru as anything more than gravel-flinging fun. 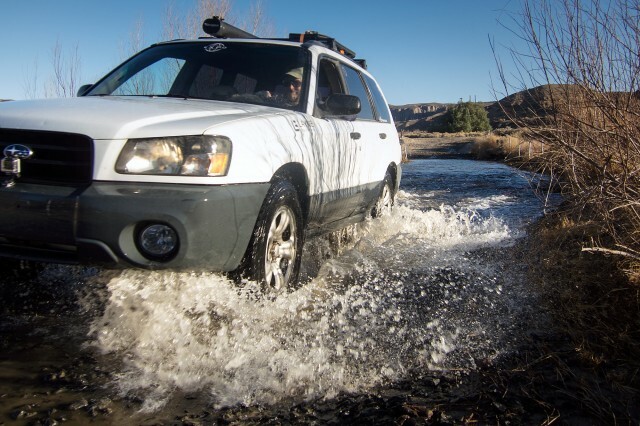 I found the idea of a mere Forester attacking moderate trails laughable, and I pushed forward expecting to gain little more than a rally-inspired softroader. 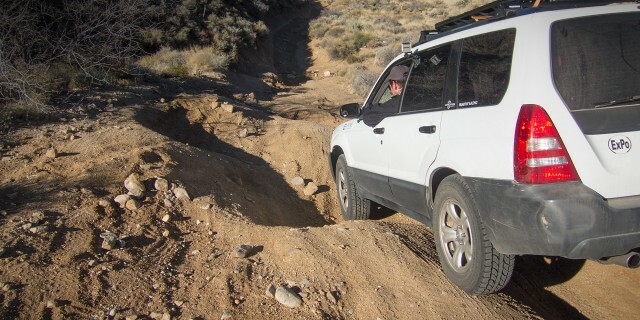 During a recent trip over the Mojave Road the little Foz shattered all doubts with it’s nimble capability. In the sand and washboard it was the speed demon we expected, cruising along comfortably at around 50mph. On the rocky hill climb after Fort Piute, a trail which rates nearly a 3 after recent storms, it was shockingly unstoppable. We managed to run the entire 140-mile trail in under 24 hours (sight-seeing and camping included) without a single issue. 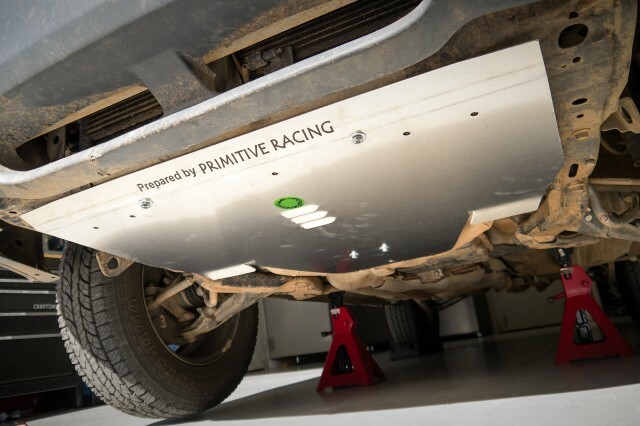 There are two big names in the Subaru off-pavement aftermarket, but Primitive is the only manufacturer to offer comprehensive protection for the SG Forester (model year 2003-2009). 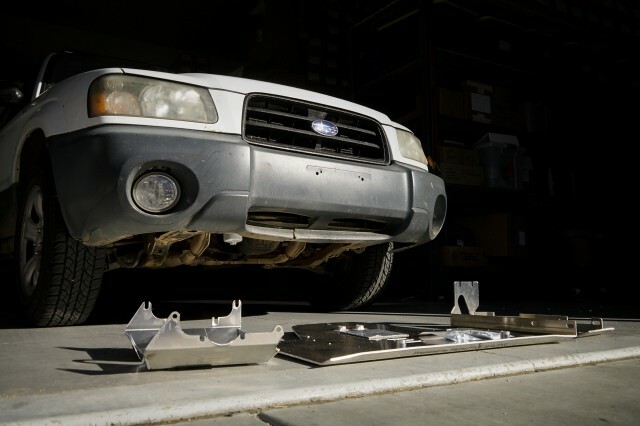 Their full armor package includes three thick aluminum skid plates which provide ample protection to the most vulnerable areas on the undercarriage for about $500. The front skid plate is formed like an upside-down 3/16ths hood, and provides complete protection for the bottom of the entire engine bay. Integrated vents allow for airflow, and options are available for an extra-length “stinger tail” and oil drain plug/filter access ports (we opted to skip the access ports for the best possible protection). 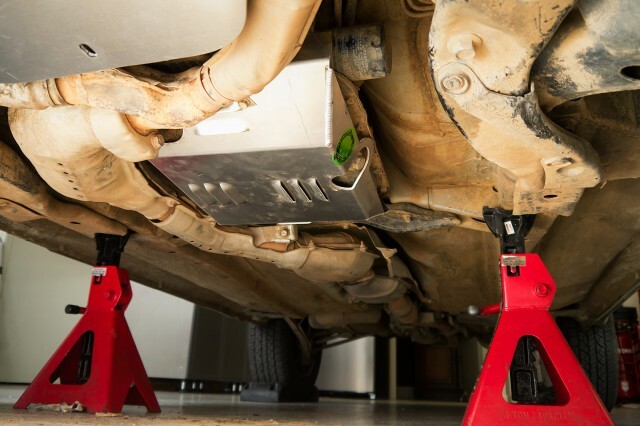 Installation is extremely easy: remove the factory mud shield, then install the new skid plate onto the pre-existing threaded holes in the frame. 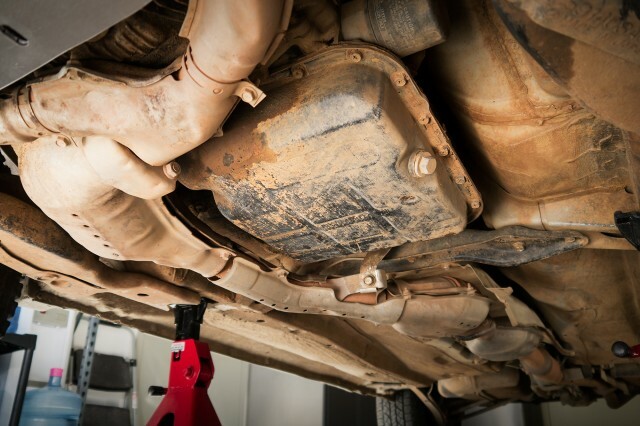 Removing the plate for service is an even simpler four-bolt process. 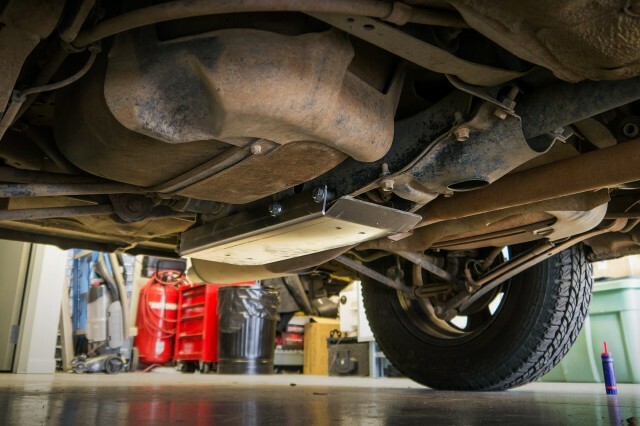 The 4EAT transmission skid plate takes a little more thought to install: an area on the forward corner of the plate is pre-notched for easy removal, as some Subaru exhaust systems can interfere with the plate (ours did). 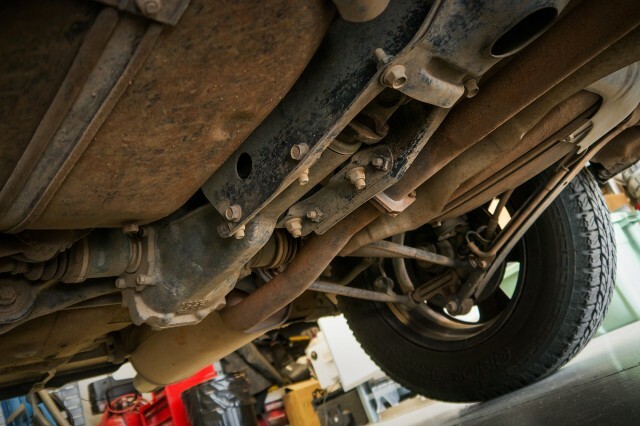 Otherwise, installation is fairly straightforward using existing bolts on the transmission housing. Ample venting is provided, as is a convenient opening to access the drain plug. 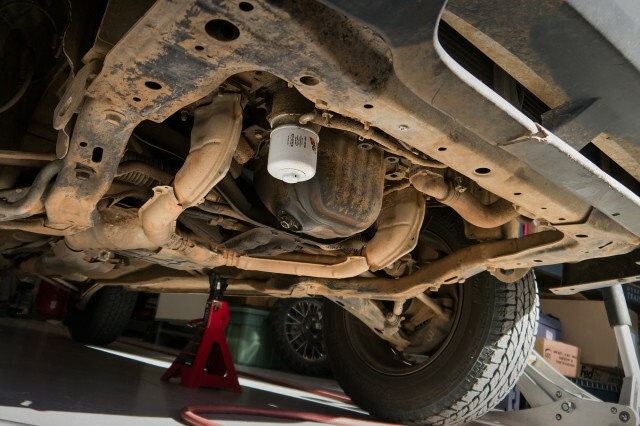 The rear skid plate is the most difficult of the three to install, requiring loosening of the rear differential then carefully keeping it in place while tightening everything back up (an extra set of hands comes in… handy). Six bolts and a few spacers (included) are used for installation. 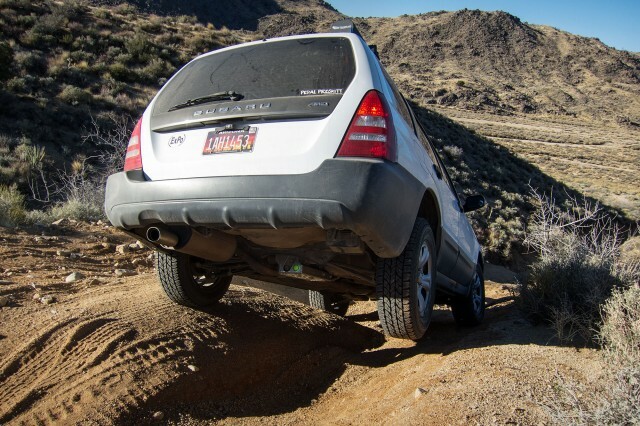 The leading edge of the skid features a stout approach ramp to help prevent hang-ups on the trail, and the rear has a large opening for easy access to the differential’s drain and fill plugs. 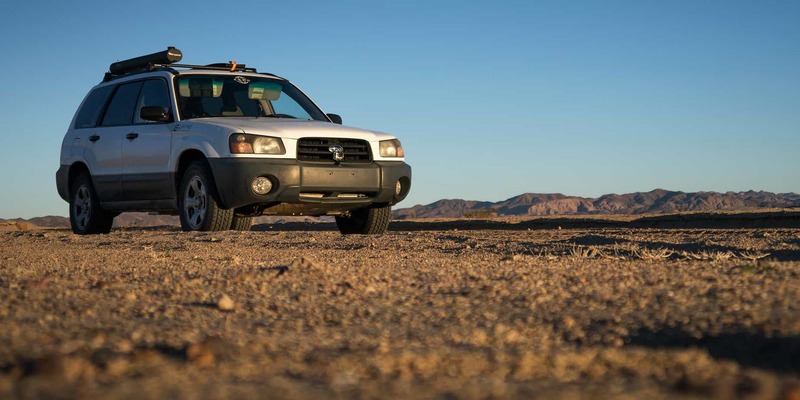 Initially, I wanted to source a light weight bull-bar for the front and a swing-out setup for the rear of the Forester. Unfortunately, the only good options are built in Australia, so shipping them stateside costs nearly as much as the bumpers themselves. 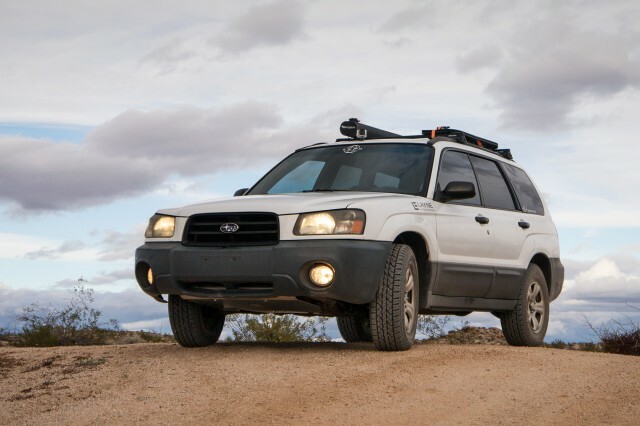 They’re also heavy—the Forester was designed to be light and fast. After a little research revealed just how inexpensive replacement stock Subaru bumpers run (about $130 each end), we opted to just treat the bumpers like the disposable emergency dampeners they’re designed to be. Besides, with careful driving and the occasional spotter assist it’s easy to keep the bumpers off the rocks. 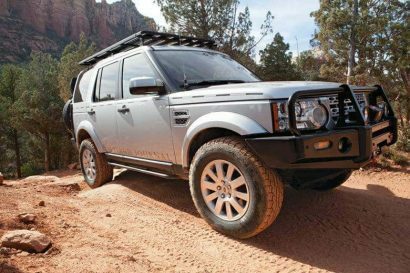 For auxiliary lighting, both Primitive Racing and Subtle Solutions build stout light bars that can handle anything you might need. I’m a designer, photographer, author, and adventurist. I’m the lead creative at Layne Studio. 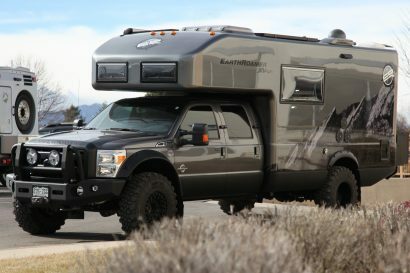 I shoot photos for clients in the adventure, automotive, and outdoor industries. 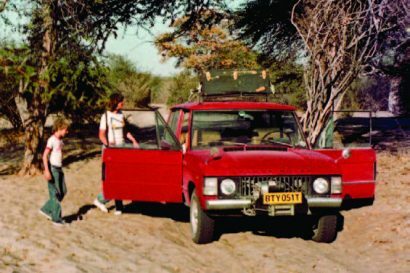 I write articles for travel and adventure publications. I make stuff in the Layne Workshop. I’m based out of Prescott, Arizona, but I prefer wanderlust over the comforts of home.